The Name of the P.A. firstly notified as “Sanjay National Park” in the year 1981 by G.O.M.P., vide Gazette notification 15-6-80-10 (02 dated 1st Oct. 1981 Government of Madhya Pradesh under section (35) of Wild Life (Protection) Act 1972 and 15-16-2001-X-2 dt. 09.03.2001. The areas of old Sidhi, Korea, North Surguja and South Surguja forest divisions were merged in order to establish the Sanjay National Park. At present part of west Sidhi’s area in M.P. is about 25% and remaining area of Korea, North Surguja & South Surguja is about 75%, which is being separated in Chattisgarh State (Named Guru Ghasidas National Park). 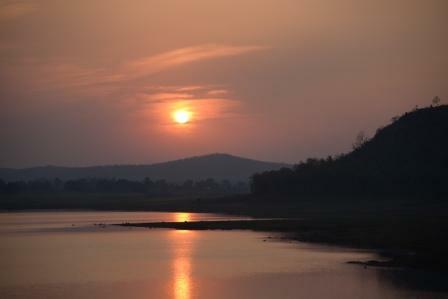 At Present the area of the Sanjay National park & Sanjay Dubari Sanctuary Sidhi is included in the Sanjay Tiger Reserve. The Sidhi district covers Mohan and Pondi Ranges under Sanjay National Park and Dubari and Bastua Ranges of sanjay Dubari Sanctuary of M.P. The Sanjay National Park extends over an area of 466.657 Sq.Kms., of this 428.949 Sq.Kms. are reserve forest; 11.327 Sq.Kms. are protected forest and remaining 26.381 Sq.Kms. are revenue area (village lands) . with 18 villages inside the Park. The Sanjay Dubari Sanctuary extends an area of 364.593 Sq. kms., of which 244.58 Sq. kms. are reserve forests, 60.03 Sq. kms. are protected forests and remaining 59.98 Sq. kms. are revenue area (Village lands) with 29 villages inside Sanctuary. 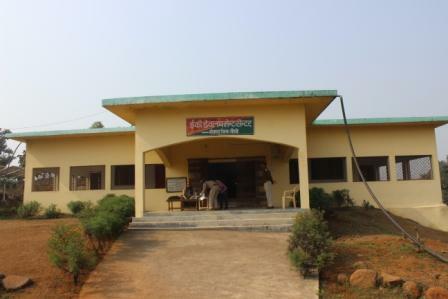 The entire area is in the charge of Forest Department. Sanjay Tiger Reserve forms part of the Central Indian Highland, Sprawling across Madhya Pradesh from north to east and internationally renowned for its anthropological and natural attributes since long. Falling in the South - West portion of the district "Sidhi" of Madhya Pradesh. The Sanjay Tiger reserve area includes Sanjay National Park, Sanjay (Dubari) Sanctuary & proposed buffer zone (part of West Sidhi territorial forest division) which dealt with lies between meridians, longitude 810-30' East and longitude 820-15' East and between parallel latitude 230-46' north and latitude 240-15' North. The Field Director, Sanjay Tiger reserve is also controlling officers for Bagdara, Sanjay Dubari and Son Gharial Sanctuary. There are Assistant Director and Suprintendents with their headquarters at Sidhi working in the Park & sanctuaries. The plain area lies in the catchment of river Gopad, Banas, Sone, Hasdo, Mawai and their tributaries. Various nalas network also exists. The Singar, Mohan rivers flows in the area. In Mohan range Mohan Nadi, Singhasan Nala, Gopad Nadi, Khurdur Nala, Satha Nala, Dhoka Nala, Sorhu Nala and many other nalas & springs network also exists. Where as in Pondi range Sundar Nadi, Mawai Nadi, Mohan Nadi, Kodmar Nadi, Khaganni Nala, Singar Nadi, Neora Nala and many other nalas network also exists with springs. The main sources of drinking water in the area are dug wells and hand pumps. The Nistar Tanks, Ponds are also used by the villagers of the P.A. area. The geological and geographical features of the Park along with the variation in elevation laid to the great variety of vegetation types which rich bio-diversity values of the Park. The major forest types occurs in the Park as per the champion & Seth’s classification (1964). 2. SA/c3 Southern dry mixed deciduous. large predator and prey system. The Sanjay Tiger Reserve with its good vegetation cover forms a part of the catchment area of rivers Son, Gopad, Banas, Mahan, Hasdeo etc, and their tributaries. Although these rivers are perennial, but becomes almost dry during the summers with very little water. Most of the Nallas are also there, and which also become dry during the pinch period. The details of these river system has been illustrated in Map, beside the rivers there are number of perennial water holes, Stopdams, Tanks, Jhirias, distributed in the Park. There are a number of good sites of scenic, aesthetic values such as Ramdaha kund (in Mohan Range), Kanahia Daha, Magar Daha and Domarpat (in Pondi Range). The Park area thus has a great potential from further development. There are so many religious sites/Temples located in the Park area where a lot of people visit every year. Thus the Park provides the great cultural, recrational and social values. According to "Revised classification of forest type of India by Champion & Seth, the area comes or classified in North Indian moist deciduous forest sub group 3C with sub type Sal moist Sal bearing forest CZ with sub division moist peninsular Sal (e). The general type is 3C/CZ(e). This type of Sal forest occurs mostly in Gondwana system. This type manifeds under growth along with bamboo. Sal crop is mostly pure forming 60% to 90% of over wood composition. Better quality of sal is found along the banks of water converses and plain areas. The forest can be classified in II and III quality with density from 0.5 to 0.8. In IVth quality areas are with density from 0.3 to 0.5. Sal regeneration is present along with water courses in whippy stages. Fires incidence, grazzing and illicit felling, lopping appear to the cause absence of regeneration. The land of under stocked, blanking areas are effected by soil erosion as in sheets rill & small gully stage. Bamboos are present in most of the sal forest area. There are no grass meadows of any significant size in the area. Sal (Shorea & robusta), Saja (Terminatia tomentosa), Dhauda (Anogeissus Latifolia), Salai(Bosswalia Serrata), Bija(Petrocarpus marsupium), Dhobin (Dalbargia Peniculata), Haldu ( Adina cardifolia), Tendu (Diospyros melanoxylone), Harra(Terminalia chebula), Bahera (Terminatial belerica), Arjun (Terminalia arjuna), Kusum (Schleichera oleosa), Semal (Bombox ceiba), Mahua (Maduca indica) etc. Amla (Emblica officinales), Tendu (Diospyros melanoxylone), Kari (Saccopetelum tomeutosum), Mahua (Maduca indica), Gilchi (Casearia graveoolens), Tinsa(Ougeinia Ojeninesis), Amaltas (Cassia fistula), Khair (Acacia cutchu), Palas (Butea monosperma) etc. Dhawai (Wood fordia fruticosa), chind (Phoenixacaulis), Harsingar (Nyctanthes arbortrisfis) Satawar (Asparagus adscendens) etc. The principal grasses met within this type area Bhurbhusi (Eragrostis tenella), Gonud (Themeda quadnvalvis), Doob(Cynodon dectylon), Lampaspo, Phuli (Apluda alvis) etc. Mahuline (Bauhinia Bahlii), Bendo (Spatholobas roxburghii), Nagbel (Cryptolepis buchanani) etc. Bagdara wild life sanctuary that was established in the year 1978 vide the GOMP Gazette notification no 15/15/77/10/3 dated: 15.2.1978. Bagdara sanctuary is located in the Singrouli district of Madhya Pradesh. Total geographical area of the sanctuary is 478 Sq. kms. The area composition is 231.047 Sq. kms. as protected forest and 246.953 Sq. kms. as revenue and other land. There is no reserve forest in the sanctuary. Bagdara sanctuary is situated in the northern portion of the Sidhi district. It is 75 km away from the Sidhi district head quarter. Nearest railway station is Mirzapur in U.P (100km) and Rewa in M.P. (170 km.). Nearest aerodrome is Banaras in U.P. (170 km). Bagdara sanctuary is famous for black bucks. Its frequency of occurrence is very much. It is one of the most spectacular and numerous of wild animals living in close proximity to human settlement. It can be seen in any season in the sanctuary. There are many rock paintings of the stone period. More research is needed from archeological department regarding these rock paintings. 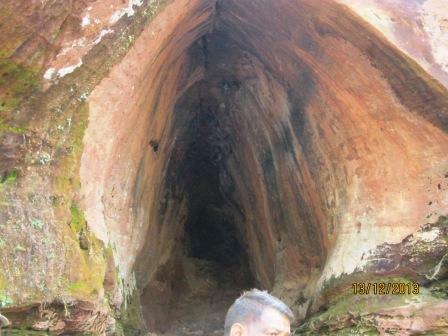 Few caves and rock shelters are very attractive. Son River makes the southern boundary of the sanctuary. There are few beautiful view point spots at hillocks. 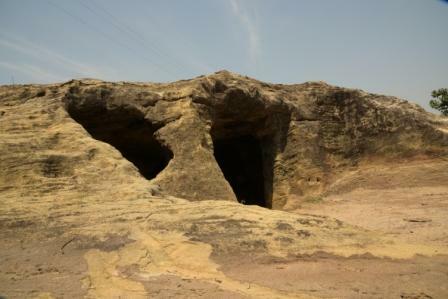 Local geological sequence is Kaimor and Bhander series of Vindhyan formation. Typical rocks are sandstone and shales. Other rock types like conglomerate, granite, lime stone and quartzites are also found. The quartzite soils are mostly unproductive. Granite rocks yields almost pure type of residual clays on weathering. The area of the sanctuary is on the left flank of the river son. The general physio-graphy of the terrain is hilly and undulating. Bagdara plateau is called “Koraval”. The slope of the hills are moderate to steep and at times precipitous. General slope of the tract is towards North and South. Cold season form November to February. Average temperature varies from 400C to 470C during summer and 50C to 340C during winter. The highest maximum temperature recorded however are 48.80C. 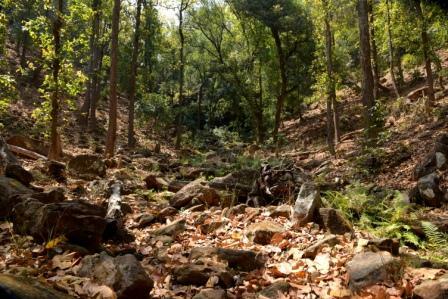 According to revised classification of forest types in India by champion and Seth, the forest can be broadly classified in the "northern dry mixed deciduous forest" Almost all sanctuary area is covered by poor quality of mixed forests. The density of crop varies from 0.1 to 0.5 interspersed with many blanks. TOP STORY- SALAI, KULU, KAHUA, HALDU, BAHERA, MAHUA, SEMAL, PARSIDH, DOBIN, SAJA, PAKAR. UNDER STORY- BER, BIRHUL, DHAWAI, KAROUNDA, SEHERUA, NEGUD, SATHAWAR, MAKOR SURPANKA, THNAR, JAMALGHOTA, GOKHRU. CLIMBERS- DUDHDBEL, KEEMACH, GARJ, MOHTAIN DOKERGEL. GRASSES- LAMPA, RATHAR, CHHIND, BHURBHUSI, BHOWRAH. The main aim for creation of Bagdara sanctuary is to give protection and increase in the population of the black buck. Cheetah was the main predator of Black buck. Due to extinction of Cheetah and protection from poaching, Black buck population is increasing constantly in the Bagdara sanctuary. Population of Black buck is highest in the Bagdara sanctuary after Palpur sanctuary in M.P. Sanctuary is well known for black buck population. Black bucks can be a seen in any season very easily. Blue bulls are also seen in abundance. Apart from wild life, some rock painting of stone periods, rock-shelters and view spots are the attractions for tourists. With the development of infrastructures, more tourist can be attracted. The name of the P.A. is derived from village Dubari. The P.A. was notified - vide GOMP Notification No.14-5-75 Forest -x-2 dated 30.08.1975. The area of the P.A. is further extended by GOMP notification No.14-5-75 Forest -x-2 dt. 15.07.78. The P.A. renamed as "Sanjay Dubari Sanctuary" in 1980 (after the death of Sanjay Gandhi) vide GOMP notification No.15-4-80-10-2 dated 09.10.80. The P.A. area lies between latitude 81025' to 85050' and longitude 23000' to 24005' degree which is situated in South-West portion of Sidhi district of M.P. The Sanjay (Dubari) sanctuary extends over an area of 364.593 Sq.kms., of this 244.58 Sq.kms. are reserve forest, 60.03 Sq.Km. protected forest and the remaining 59.98 Sq.Kms are village lands. The entire R.F. and P.F. 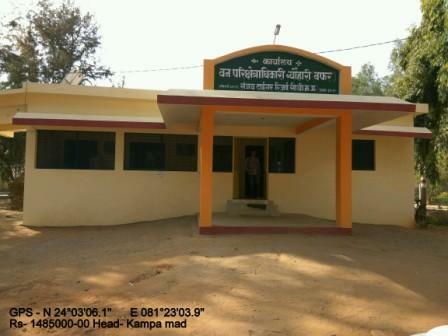 area is in the charge of Forest Department. 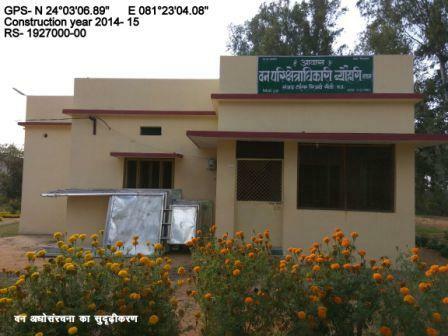 Sanjay (Dubari) Sanctuary is approached from Sidhi-Shahdol road via Mazouli and is 10 Kms. from Mazouli. It is 130 Kms. from Shahdol (Pop 28490) and 65 Kms. from Sidhi (Pop. 8341). There is no direct bus for Sanctuary. Katni-Singrauli-Chopan rail line passes through the Sanctuary and Dubari itself is a railway station which is 127 Kms. from Katni (Pop.86500). Another railway station Joba is 10 Kms. from Mazouli. This railway station is 4 Kms. from Sanctuary area. There is a fair weather air strip 9 Kms. away from Sidhi by the side of Sidhi-Rewa road. Rewa (Pop. 69182) is 160 Kms. from Sanctuary. The nearest township from the Sanctuary is Sidhi. Sidhi is the district place having all facilities of stay (circuit house, P.W.D. rest house, Forest rest house and hotels), medical & communications. The nearest facilities from the Sanctuary area are Parsili P.W.D. rest house, 10 Kms. from Mazouli, Bastua Forest rest house on the boundary of eastern part of the sanctuary. The nearest Petrol Pump is at Mazouli, 10 Kms. from the Sanctuary area. 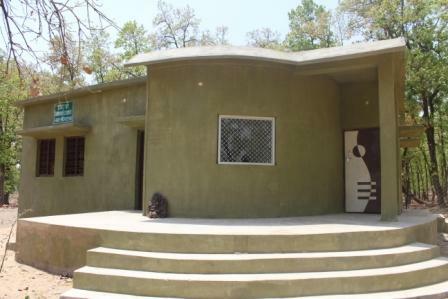 The Sanctuary is of special importance as it is the birth place of Mohan, The world famous White Tiger of Rewa. The Mohan was caught by his highness Maharaja of Rewa State in 1951 from the Forest Compartment No.214 at the Badgadi Nala caves, situated near village Pankhora of the Sanctuary. After Mohan there have been further reports, all unconfirmed of sighting of White Tiger. The gene of whiteness however is expected to be surviving in the area. The Sanctuary eco system constitute the protective areas significant for conservation bio province of "central high lands" as per the Rodgers and Panwar's classification of 1988 (Wild Life Institute of India). The area comes in the "Bio-province No.6 CD". The Sanctuary is rich in Bio-diversity have great potential to provide good habitat for wild life with the little improvements in the habitat conditions. The soil of the Sanctuary is immature soil of less variety and low fertility with low depth & sensitive to soil erosion. 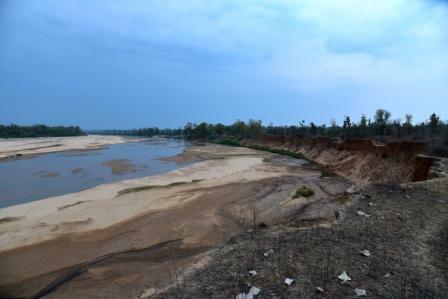 There are plenty of rivers, nalas, and other perennial sources of water and have ample water over its sandy and rocky beds, which are very useful for wild animals and birds in summer season. Water shortage becomes particularly acute in those years when the rainy season finishes much early or is not followed by winter showers or when the total rainfall of the year falls much short of optimum. 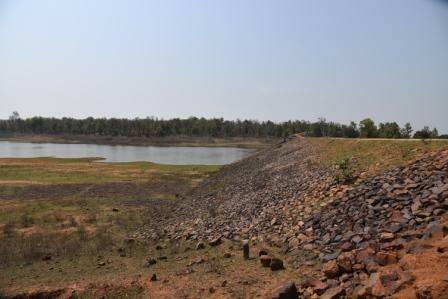 List of such perennial sources of water is as under :- Banas river, Kodmad river, Mawai river, Umadari nala, Bijaur nala, Bastua nala, Belha dam, Dewa tank, and other water holes. 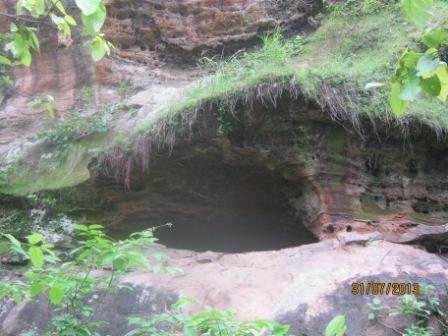 The local geological sequence in the Sanctuary area is Mahadeva series of Gondwana formation. 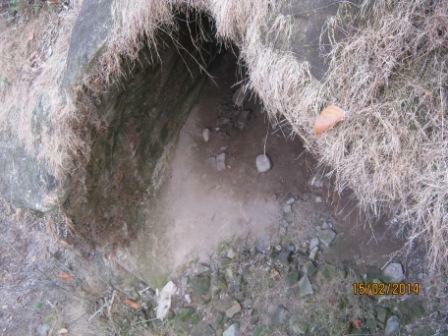 The typical mahadeva beds are considered to be highly ferruginous and often breaching in to small pieces. The rocks generally met with area Quartzite, Granite, Sand stone, Micashists, horn blends, schist, shales, lime stone (to some extent) etc. These rocks give rise to immature soils of less variety and fertility. The depth of the soil is generally inconsiderable. In plain portions the soil is generally sandy to sandy loam. The area of the Sanctuary is on the right flank of river Banas. The entire tract lies in the catchment of river Banas. Tributaries namely the Mawai river, the Kodmar river and the Umarari river flow in to Banas river. The general drainage of the Sanctuary area is in North-East direction. The P.A. area is more or less rectangular in shape with about 19 Kms. length of width. The Banas flows in to the Son river which flows towards North-East meeting ultimately the Ganga river. The general physiography of the terrain is hilly and undulating to plain over major portion especially towards Northern and Southern parts. There are three distinct seasons. The cold weather which sets in at the beginning of November and lasts till the end of February is generally bright & cloudless. The hot weather lasts from the beginning of March to middle of June. It is very dry and extremely hot. Hot wind blooms from April to June. The rain breaks by the middle of June and continue to the end of September. The mean annual rainfall is 1168.40 mm. The normal fluctuation of the mean annual rainfall are expected to have the range of 1059.70 m.m. to 1277.10 m.m. The adverse effect on plant growth is most marked, when the annual rainfall is much below the critical value, e.g. 1059.70 m.m. The P.A. does not have a long history of recreational and cultural use by visitors. Forest of the P.A. & Surroundings have many important sites of natural heritage and interest to visitors for its rich wildlife and scenic beauty. Although a highly potential area for tourism both domestic and international. Sanjay Tiger Reserve has yet to become a real tourist attraction mainly due to poor approach and lacking infrastructure. Number of tourists having wildlife interest and nature lovers and research people coming here frequently. Intensity to increase tourist is to improve infrastructure, mainly conveyance for visiting the park, and suitable accommodation outside, shall develop in due course of time, a perceptible increase in the number of tourist actually interested in wildlife may be anticipated. These large numbers of visitors may become exponchts of nature conservation in future. Head-core and dedicated nature tourists. First category of tourists is tolerant and they require only information about the area for understanding nature. Such tourists take care to avoide any damage to nature and wildlife. Mainstream nature tourists require information, guidance and interpretation material to learn about nature and wildlife. Such tourists can be managed under established tourism management and regulatory method. Third category of tourists has less interest in nature and conservation of the biodiversity. This group of tourist may cause disturbance to nature if their activities are not regulated properly because they are less concerned to the damage of flora and fauna. Park remains open from 1 st. November to 30 th. June from sun rise to sun set. Best time to visit is from December to March. The Sanjay Tiger reserve is about 700 Kms. From the capital (Bhopal) of the State. The area is approachable by train up to Rewa and the remaining 80 Kms. have to be travelled by road, in order to reach Sidhi, the Park head quarters. From the Park headquarters at Sidhi the Park area is about 70 Kms (entry in Mohan Range of the Park) and about 65 Kms. (entry in Pondi Range of the Park). 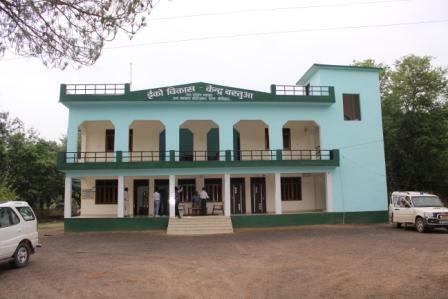 Headquarter of Mohan Range is Kusmi Village which can be approached directly by rail. Nearest Railway Station Shankarpur Bhadaura (Katni-Chopan Link) 30 Kms. From Kusmi or Sarai (Howrah – Jabalpur Link), 40 Kms. from Kusmi. There is a fair weather air strip 7 Kms. away from Sidhi by the side of Sidhi – Rewa road. The nearest township from Sanjay Tiger reserve is Sidhi district head quarter having all facilities to stay (Circuit House, P.W.D. Rest House, Forest Rest House, Petrol pumps & Hotels), and medical & communications facilities. 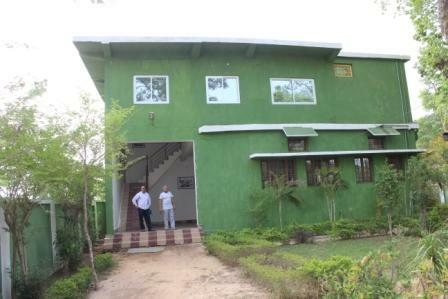 The nearest facilities from the National Park area are Bastua Forest Rest House, 5 Kms. 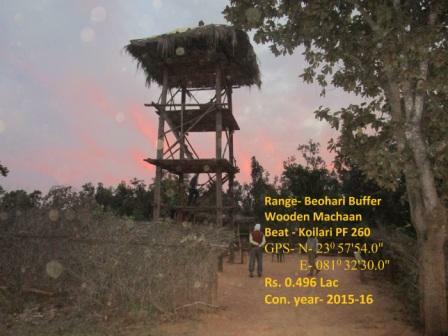 from Pondi range head quarter, Pondi Forest inspection hut at Pondi Village itself, Kusmi forest inspection hut at Kusmi village itself for Mohan Range and Tikari forest rest houst at Tikari village, 45 Kms. from Mohan Range head quarter.